Ballinlough struck two late goals to stun St. Michaels and grab an unlikely victory in the first round of the I.F.C. in Kilmainhamwood on Sunday evening. With sixty minutes completed St. Michaels had what looked liked an unassailable lead; 0-16 to 0-10, but what unfolded in three minutes of injury time was truly remarkable as Ballinlough hit two goals and a point to grab victory from the jaws of defeat. St. Michaels have showed impressive form so far in 2017, while Ballinlough have struggled with injuries and retirements; the teams occupied opposite ends of the Division 2 A-League. All the signs were that the Carlanstown/Kilbeg outfit would prove too strong for the North Meath side, but the opening 30 minutes was quality championship fare as Ballinlough shuck off the burden of their poor league form and matched their opponent in most sectors. 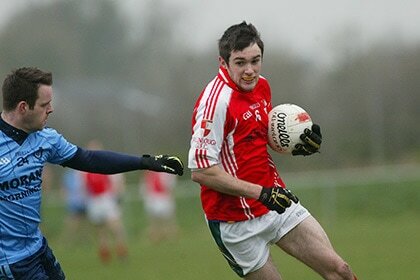 The combination of Shane Mc Donnell and Oran Meehan in the St. Michaels full-forward line was a source of constant problems for the Ballinlough defence and both players kicked early points as the sides were level, 0-3 to 0-3, after 15 minutes, Tommy Mc Cullen and Peadar Byrne (2) were on target as the opposite end. Ciaran Lynch kicked a free to push St. Michaels ahead, 0-4 to 0-3, but his direct marker; Sean Geraghty, was causing problems with his probing runs and he created an opening for Peadar Byrne to bring the sides level after 18 minutes. Ronan Lynch and Peter O’ Connell kicked points as St. Michaels moved the ball at pace but Byrne was proving a real handful in the Ballinlough attack, he kicked three points (all frees) before the interval and along with a good score from Ronan Mc Guinness, it ensured the sides were level; 0-8 to 0-8, at the switch of ends. St. Michaels started the second half full of intent; as Ballinlough aided by the breeze pumped long ball into their forward line, with limited success. Mc Donnell and Meehan were growing in confidence and they shared four points as St. Michaels surged ahead; 0-12 to 0-9, after 39 minutes. Short a few regulars and with a number of players only recently returning from injury Ballinlough appeared to be wilting and further points for St. Michaels from Ronan Lynch, Ciaran Lynch (f) and Phelim O’ Reilly left Brian Donogues charges with a mountain to climb; 0-15 to 0-9, with only ten minutes remaining. Derek Muldoon entered the action and along with young midfielder Kevin Byrne he gathered some crucial possession in the closing stages. Peadar Byrne and Ciaran Lynch traded frees as the scoreboard read; 0-16 to 0-10, with normal time completed. But instead of accepting defeat Ballinlough poured players forward, Tommy Mc Cullen kicked his second point and then his brother Mark contested a high ball with St. Michael’s goalkeeper Darren O’ Connell and the ball spilled into the net, after some debate referee Padraig Coyle awarded a goal. Only seconds remained and still two points separated the sides; 0-16 to 1-11, but from the resulting kick-out Ballinlough gained possession and Michael Geraghty charged through the heart of the St. Michaels defence and unleashed a powerful shot inside the post and beyond the despairing dive of Darren O’ Connell. The Ballinlough support celebrated wildly as St. Michael’s launched one last attack but when defender Robbie Farrell made a perfectly timed tackle and the ball broke loose the final whistle sounded as Ballinlough earned a crucial victory. Best for ‘The Reds’ were; Lorcan Gibney, Sean Geraghty, Kevin Byrne, Peadar Byrne and Ronan Mc Guinness. Ballinlough: L. Gibney, B. Smith, E. Smith, R. Farrell, J. O’ Reilly, S. Geraghty, L. Maguire, T. Mc Cullen (0-2), K. Byrne, M. Geraghty (1-0), M. Mc Cullen (1-0), J. Baugh, J. Tunney, P. Byrne (0-8, 6f), R. Mc Guinness (0-1). Subs: D. Muldoon for O’ Reilly.